Thirty days starting today. Thirty reasons reflecting life, love, and liberty. 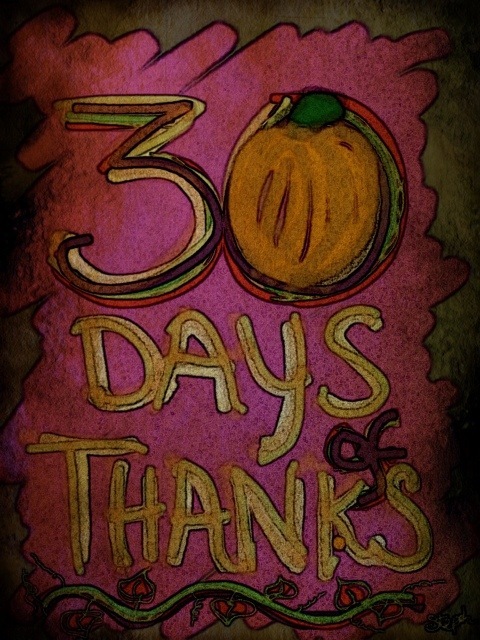 Thirty ways expressing my thanks. My road to now has been riddled with chance and circumstance. Each step past bend and valley providing me with an opportunity to stray. I arrive today worn and weary, yet full of hope for the future. That or my sugar buzz from last night’s Halloween candy has yet to wear off. November 1, 2011. I doodled this month’s marker on my iPad using ArtRage and PhotoWizard. I LOVE your illustration! 🙂 Thanks for joining me on the TDOT journey! Thanks, Angela! I loved your posts last November. Thanks for the inspiration!